It is not that often that I receive a request to review a funny and humorous book, so my thanks to Quartet Books for sending me a copy. Yes this really is funny. Allow me to whisk you away to a place called windy place called Saltmarsh situated on the Kent coast and here we meet Ronald Tonks, and he lives in a place he calls ‘The Shack’ the roof leaks he shares his home with his dog (Bingo) who is going bald in places and he is always short of money, Ronald is a feisty chap now at the ‘collecting pension’ stage of his life he is 71, his body is rapidly falling apart, he suffers the ongoing saga of his 90 year old mother who daily gives him many things to worry about then we have his 45 year old Son. This is based around the year in the life of Ronald Tonks (2012) and the group of ‘platonic’ friends that Ronald surrounds himself with, the trouble is they are all very much in the same position as Ronald. There is one woman that Ronald does not just want a platonic friendship with but rather a bit more her name is Daphne but their friendship is more of an on/off friendship. Ronald became my hero reading this, a real trooper, a campaigner one who carries his bus pass with pride like the wearing of a Blue Peter badge. At times you find yourself laughing so much it is so superbly written. This is a genuinely funny and witty read, I loved the way that Hennessy has created the characters at this time in their lives and that many will love. Not Far From Dreamland will appeal to much wider audience than the age group of the leading characters in Not Far From Dreamland many will fall for Ronald and his ‘platonic’ group of friends. There is scope within this book for a sequel and I can only hope that Hennessy is right now penning that very book and I for one would be happy to review the sequel. Val Hennessy taught English and drama before commencing a writing and journalistic career with the Brighton Voice, Peace News and Big Scream. Hennessy later became a Fleet Street freelance journalist, an associate editor of Time Out and a columnist for Saga Magazine. She was described by Auberon Waugh as “a handsome if elderly (by punk standards) and inescapably middle-class journalist She is best known for her work as chief literary critic for the Daily Mail from 1989 to 2004. As of 2014, she continues to write for the Daily Mail ’s ‘Retro Reads’ column. Having reviewed thousands of English fiction books, Hennessy is a significant critic of British women’s writing. Hennessy has interviewed Luciano Pavarotti, Leonard Cohen, Bob Dylan, Annie Lennox, Michael Douglas, Terence Stamp, Martin Amis, Vivienne Westwood, Elizabeth Taylor, Bob Geldof, David Bailey, Jeffrey Archer, Germaine Greer, Laurie Lee and José Carreras. Throughout her career, she has also written for The Guardian, The Observer, New Society, You Magazine, Spare Rib, City Limits, and London Evening Standard. 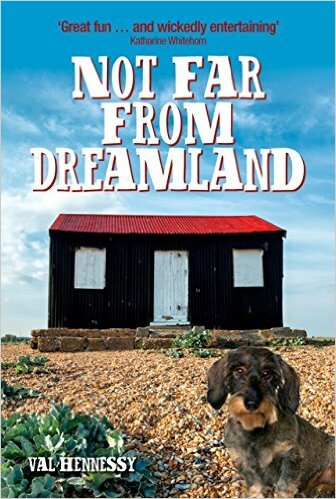 Not Far From Dreamland was released on 1 June 2015 and is published by Quartet Books.